Type “orthopedic surgeons” in the Twitter search window and “Dr. David Geier” is featured at the top of the results page. He’s approaching 5000 followers and has tweeted more than 10,000 times. 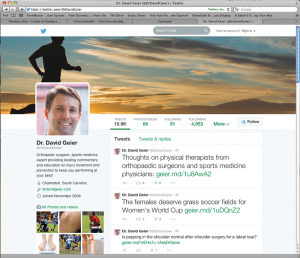 The Charleston, SC-based orthopedic surgeon and sports medicine specialist has this branding and social media thing down. 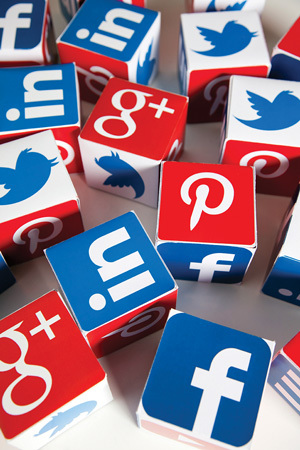 There is considerable debate in medical circles as to whether physicians and other healthcare practitioners should embrace social media as a platform to explore and exchange medical information. Patient privacy (and complying with Health Insurance Portability and Accountability Act regulations) was the reason most cited by those physicians who are not using social media in the MedData Group survey. Other reasons included concerns about time, liability, unfamiliarity with social media, and viewing it as having little value professionally. For confidentiality reasons, Czuppon tries to avoid direct contact with current or former patients, although admittedly she has a few Twitter followers of this type. But with nearly 200 million Americans looking online for information about their doctors, their diagnoses, and their treatment options, online aficionados say it’s an opportunity for healthcare providers to exchange information, educate, connect, and, potentially, attract more patients. Luks, who is associate professor of orthopedic surgery at New York Medical College and chief of sports medicine and arthroscopy at Westchester Medical Center in Westchester, NY, has been active in digital and social media for about seven years. His website, which includes his blog, gets nearly 140,000 unique visitors each month. He has more than 16,000 followers on Twitter and has tweeted almost 37,000 times. He also has a Facebook Fan Page and is on LinkedIn, YouTube, Google+, and Vimeo. A common theme among some proponents of utilizing social and digital media in healthcare is consumer education. A fringe benefit is added exposure for the practitioner. 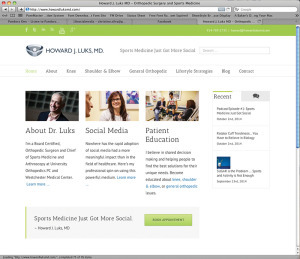 Luks, who serves as an advisory board member of the Mayo Clinic Center for Social Media in Rochester, MN, said serving the educational needs of the public through his digital and social media presence has had a significantly positive effect on his practice and his reputation. Notably, he was named one of the Top 10 Social Healthmakers for Osteoarthritis by Sharecare, an online health and wellness engagement platform. 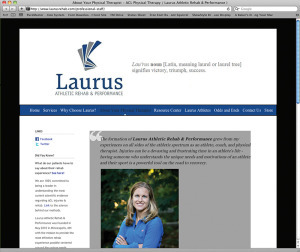 Julie Eibensteiner, DPT, owner of Laurus Athletic Rehab & Performance in Minneapolis, MN, has an affinity for Facebook because of its relative ease of posting educational information for patients in a user-friendly manner. However, she also has found a home on Twitter. She has tweeted 17,000 times since joining in 2010 and has more than 2500 followers. 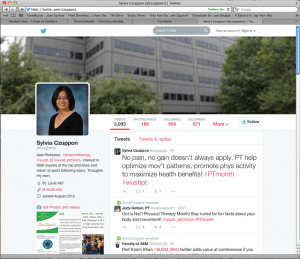 Czuppon also sees social media’s role in orthopedics as a tool with which to educate, communicate, and collaborate. “I think there is a great opportunity to educate the public regarding topics such as the importance of exercise, injury prevention, and rehabilitation,” she said. More than half—57.5%—of the Journal of Medical Internet Research study respondents perceived social media as beneficial, engaging, and a good way to get current, high-quality information.5 Also, 57.9% said social media enabled them to care for patients more effectively, and 60% said it improved the quality of patient care they delivered. Geier also sees the importance of interacting with the public online, whether it is with colleagues in the same field or with potential patients. However, he is cautious about interacting with current patients, and instead refers them to traditional methods of communication through his practice. “I do think providing the public with health information discussed in easy-to-understand language from a qualified medical professional is extremely valuable, as a huge percentage of adults go online looking for health information,” Geier said. Although Geier doesn’t use social media for patient interaction, he says he has patients who have chosen him after reading his articles online or listening to his podcasts. Geier attributes, indirectly, an increase in patient volume to his social media efforts. “I don’t use my website or other social media accounts to promote my practice or to convince people to choose me as their orthopedic surgeon,” he said. “[However], the articles I write and post on my website help people learn how I discuss injuries, so they often become comfortable with me and choose to see me when they need a surgeon down the road. Angela Smalley, MS, BOCPD, COF, who is in private practice in the Buffalo, NY, area, is the author of the “Walk well stay well” blog. 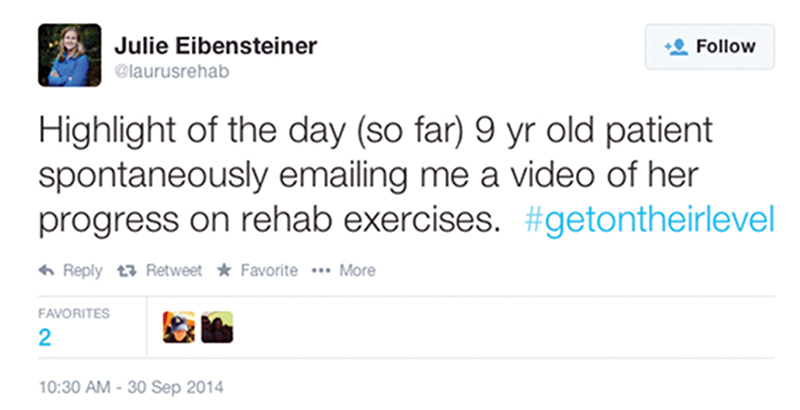 She, however, is not too concerned about recruiting new patients from her social media endeavors. Besides the ability to impart such information to the public and potential patients, digital and social media is a networking and educational breeding ground for medical professionals. 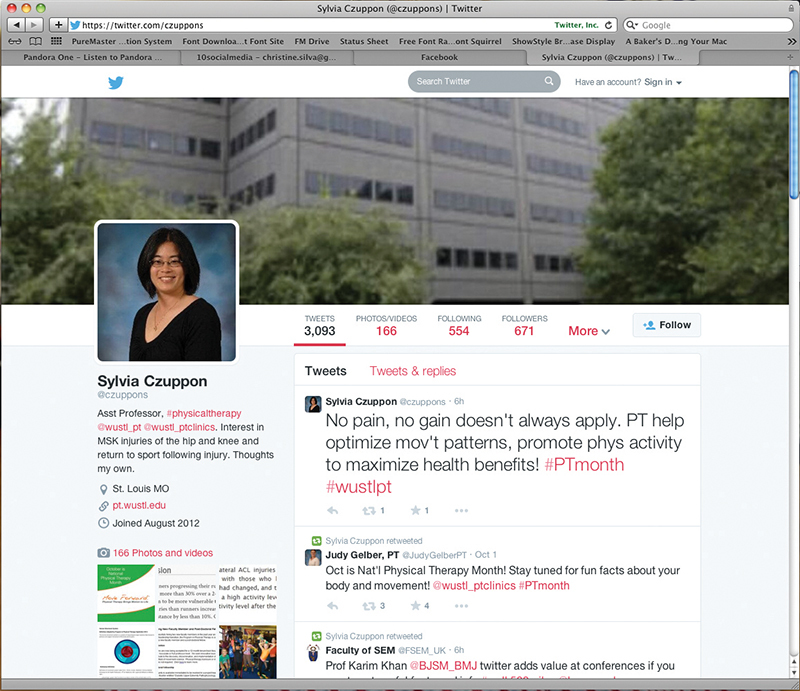 While Czuppon originally joined Twitter to just see what all the hype was about, she quickly found that she could connect with people interested in similar areas of interest—anterior cruciate ligament injuries and other sports injuries, and particularly injury and reinjury prevention. 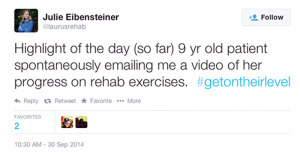 Eibensteiner also uses Twitter for information gathering and interaction with others. Smalley values the interaction with other practitioners and the discovery of new research trends that social media has provided. She also said social media has the added benefit of being able to position a business, or the practitioner in private practice, as a subject-matter expert. Luks’ echoed that sentiment. 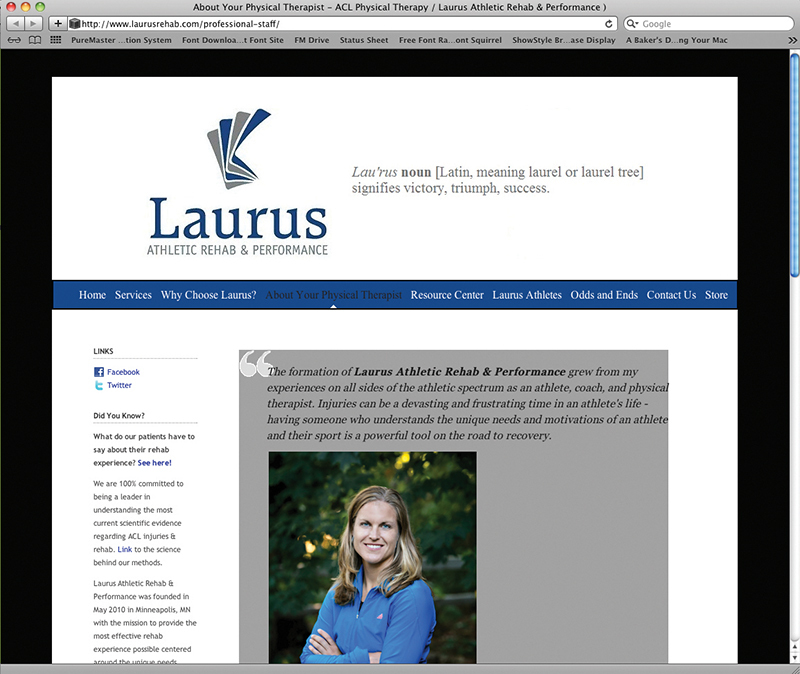 “[Social media] can bring you the attention you are seeking on a particular injury or topic,” said Luks. To best position oneself in the spheres of Twitter, blogging, and the like, and reap the benefits, the key is knowing the tricks of the trade. The tip that gets the first nod is time. For the 51% who cited time limitations as a challenge, seasoned user Geier says to make time. He spends 10 to 20 hours per week writing articles, a newspaper column, and his blog (“Sports Medicine Simplified”), producing podcast episodes, tweeting, and posting to Facebook. Share health information with a larger audience. “Newsjacking,” which is injecting one’s ideas into a breaking news story to generate media coverage and social media engagement, can be a very useful tool when entering the social sphere or blogging. In a good use of newsjacking, the Radiological Society of North America capitalized on the blackout during the 2013 Super Bowl with its Facebook posting that read: “Well, at least radiologists can work in the dark. 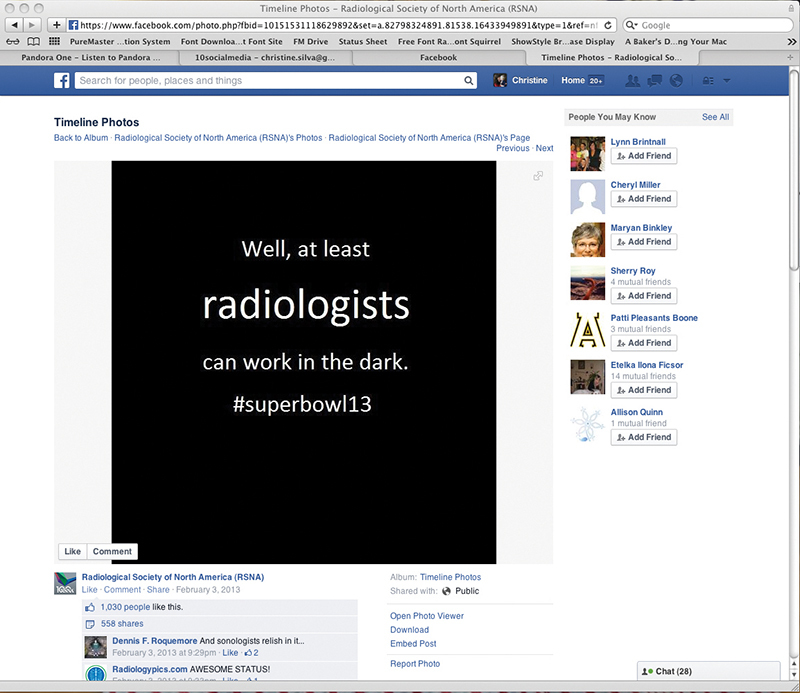 #superbowl13.” It got people talking, as well as 700 likes and more than 400 shares. Because she works for an academic institution, Czuppon says she has to be careful that the statements she makes are not construed to be the beliefs of the university or her clinic, but are her own. And, like many individuals, she has both a personal and professional Twitter account. Geier manages his accounts himself. However, he hired consultants to set up his website, and again to redesign it. 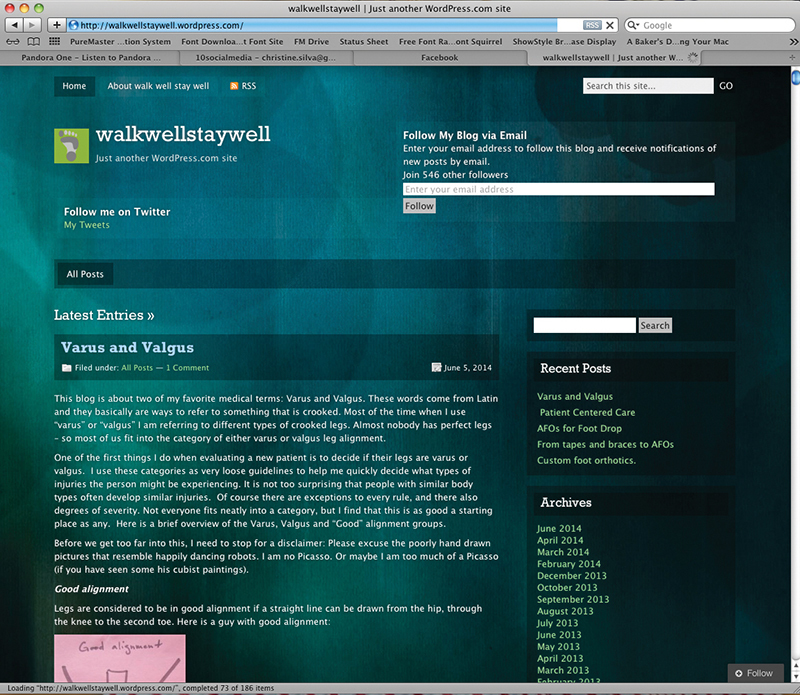 Because Smalley uses each social media interaction as a learning experience, she doesn’t use a social media consultant. 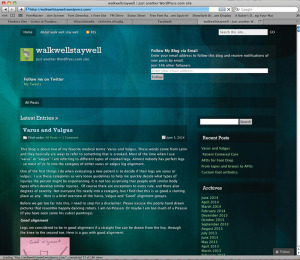 Smalley said she spends about an hour each day maintaining a presence on Twitter and answering comments on her blog. “I link my blog posts and some tweets to my Facebook account to keep postings fresh there as well,” she said. Robert J. Butler, PT, PhD, is an assistant professor of physical therapy at Duke University School of Medicine in Durham, NC. While hesitant about the practice, he said the responsibility of managing social media in his department is a shared one. #socialortho, which happens to be an alert about a Tweet Chat called Social Media Saturday co-moderated by Geier. For the medical professional who is apprehensive about “socializing” publicly, there are several physician-only online communities, such as orthomind.com and doximity.com. They tend to be viewed as safer while also providing a higher-quality source of medical information than the more public applications such as Twitter, LinkedIn, or Facebook. There are thousands of members on orthomind.com, which was created by orthopedic surgeons and restricted to orthopedic surgeons. The platforms allow orthopedic surgeons to collaborate privately and share information, such as emerging trends. There are also numerous specialty-specific online forums, as well as state medical society forums with restricted access requiring membership. The amount of information available on social media exceeds the cognitive capacity of any one practitioner, but the benefits of social media can also feel very personal. Follow P.K. Daniel on Twitter at @pkdaniel. 1. Pew Research Centers Internet & American Life Project (Health Fact Sheet). Pew Research Center Web site. http://www.pewinternet.org/fact-sheets/health-fact-sheet/. 2014. Accessed 20 Sept. 2014. 2. Resources – 50+ Facts & Fiction. Immersion Active Web site. http://www.immersionactive.com/resources/50-plus-facts-and-fiction/index.cfm. 2014. Accessed 24 Sept. 2014. 3. McGowan BS, Wasko M, Vartabedian BS, et al. Understanding the factors that influence the adoption and meaningful use of social media by physicians to share medical information. J Med Internet Res 2012;14(5):e117. 4. Physician Adoption of Social Media. MedData Group Web site. http://www.meddatagroup.com/wp-content/uploads/MedDataGroup-Physician-Adoption-of-Social-Media-Q22014.pdf. 2014. Accessed 18 Sept. 2014. 5. McGowan BS, Wasko M, Vartabedian BS, et al. Understanding the factors that influence the adoption and meaningful use of social media by physicians to share medical information. J Med Internet Res 2012;14(5):e117. 6. Young A, Chaudhry HJ, Rhyne J, Dugan M. A census of actively licensed physicians in the United States, 2010. J Med Regulation 2011;96(4):10-20. 7. Physician Adoption of Social Media. MedData Group Web site. http://www.meddatagroup.com/wp-content/uploads/MedDataGroup-Physician-Adoption-of-Social-Media-Q22014.pdf. 2014. Accessed 18 Sept. 2014.